Turkey Blames JPMorgan For Lira Crash, Launches Probe; Erdogan Threatens "Manipulators"
Thread: Turkey Blames JPMorgan For Lira Crash, Launches Probe; Erdogan Threatens "Manipulators"
On Friday, when the Turkish lira suddenly cracked, and suffered its biggest one-day drop since last summer's crisis as public attention turned to the sudden plunge in the nation's reserves and the bank's unexpected 150bps equivalent tightening in policy, JPMorgan FX strategists poured gasoline on the fire when - as the lira was sliding - they published a note recommending a 5.90 target on the USDTRY. As JPM analysts Anezka Christovova and Saad Siddiqui wrote on Friday morning recommending a lira short, Turkish authorities would likely "attach less significance to lira stability and reduce FX reserve support" for the currency following March 31 elections, resulting in further lira weakness, adding that the pace at which Turkey’s burning net foreign reserves is “unsustainable” and therefore “FX reserve support will abate post local elections on March 31, which could lead to USDTRY trading substantially higher." .... JPM's note only added impetus to the selloff, and by the end of the day, the TRY has crashed almost 400 pips, closing 5.5% lower on the day as it almost hit JPM's target, and sparking fresh panic that Turkey's economy is once again on the edge. Predictably, it also sparked Erdoga's fury, with Turkey’s banking and capital markets regulators opening separate investigations into JPMorgan Chase the bank's recommendation to short the lira. 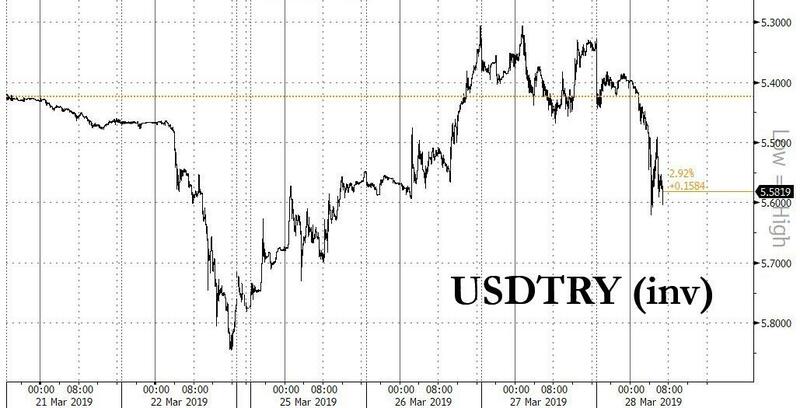 Desperate to create a scapegoat for the sudden plunge in the currency, which as it turned out had since last summer been artificially propped up by local banks (while the central bank pretended not to intervene), Turkey delighted at the opportunity to blame the plunge in the lira, which is only just now restarting, on JPMorgan. As a result, the banking regulator BRSA said the JPMorgan analysts’ note had “misguiding and manipulative” content that resulted in volatility in markets and hurt the reputation of Turkish banks, according to state news agency Anadolu. The Capital Markets Board began its own investigation on similar grounds, according to a statement on its website. 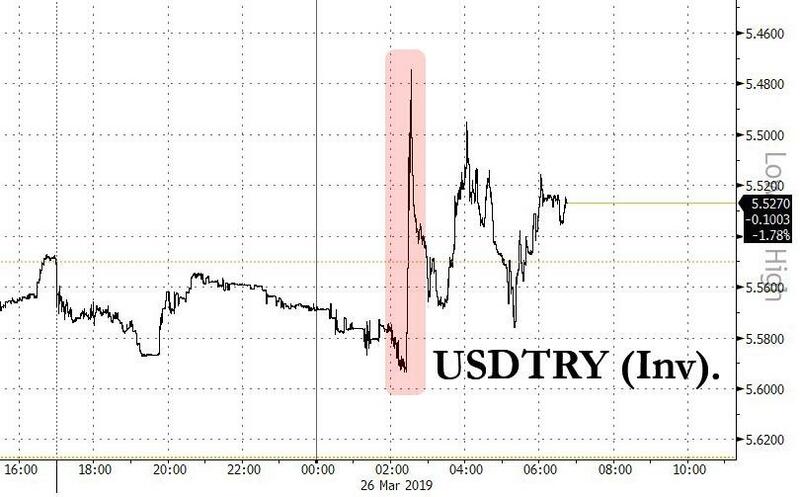 According to Bloomberg, the disclosure of the two probes almost simultaneously suggested coordination between the regulators one day after the Turkish currency plunged as much as 6.5% against the dollar, leading retreats among emerging market peers. Panicked by the plunge, Turkey’s central bank was forced to announce a surprise tightening action in the middle of the day to stem the lira’s slump but it only made the selloff worse. And in keeping with some quite bizarre banana republic measures, the banking regulator began another investigation against banks that manipulated their own clients to buy foreign currencies without naming the financial institutions that are targeted, Anadolu reported. ... which in Turkey is not just a figure of speech but virtually an assured outcome. Meanwhile, the real question is how have more investors not realized that Turkey was and remains a quasi dictatorship, one where the rule of law will be changed and trampled any time it suits the "executive president", whose power will become even greater after next week's elections, and why is the lira not far lower than where it is now. The Turkish lira resumed its plunge on Thursday following a sharp rebound on Tuesday when Turkish authorities unleashed an unprecedented assault on lira shorts, helping push the TRY briefly higher ahead of regional elections, after a disappointing reading on the central bank's net FX reserves stoked fears that the country was even closer to a full-blown currency crisis than investors had feared, while local accounts continued to accumulate foreign currency after overnight swaps on the Turkish Lira collapsed to just 40% from a historic high around 1,338% on Tuesday. After nearly a week of chaos that one trader described as unprecedented in his two decades in the market ("I've never seen a move like this in the 21 years I've been watching the market"), it appears President Erdogan has relented, and following a vocal outcry from the international community which was effectively trapped in lira positions, both long and short, after overnight swaps hit rates well above 1,000%, on Tuesday the swap plunged as low as 18.5%, in line with recent historical prints, and an indication that after doing everything in its power to squeeze shorts (and longs) the central bank appears to have capitulated. As we reported previously, bankers and analysts at large international banks reported that Turkish lenders appeared unable or unwilling to provide lira in exchange for currency this week, in an attempt to prevent short selling. While Turkey’s banking association (TBB) on Wednesday night denied claims that the country’s lenders had been limiting or halting sales of lira to foreign banks, one London-based analyst told the FT on Tuesday that Turkish banks told him they had been ordered “not to lend even a single lira to foreign counterparties” That squeeze sent the cost of borrowing lira soaring for foreign banks and hedge funds, although as shown above, it has since tumbled. 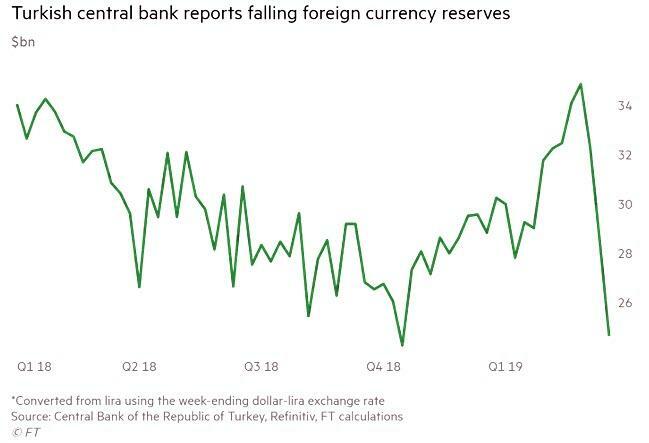 Meanwhile, the underlying pressures facing Turkey accelerated, and on Thursday data showed another dizzying drop in Turkey's foreign exchange reserves brought the total decline for the first three weeks of March to 45.1 billion lira, or about $10 billion. According to FT calculations, Turkey has now burnt through at least a third of its foreign reserves this month in an effort to stem a plunge in the lira ahead of local elections at the weekend, putting the country on path to a full-blown currency and funding crisis. According to the central bank, reserves now stood at about $24.7 billion, down from $28.5 billion a week earlier, a 13% drop in one week. The latest currency sell-off added to deepening turmoil on Turkish financial markets, which have been in flux for almost a week in a deja vu of last summer’s crisis that sent the lira tumbling to record lows, with lasting effects on the economy. In a push to reassure the market, Central bank governor Murat Cetinkaya told the state-run Anadolu news agency that net foreign-currency reserves had risen in the final week of the month, rising by $2.4 billion during the past week, although this could have been due to a simple accounting trick: on Thursday, the Turkish central bank raised the limit on Turkish lenders’ FX-lira swaps with the monetary policy authority. The limit was raised to 30% of so-called FX Markets Transaction Limits determined by the CBRT for commercial lenders from 20%. The increase to the swaps limits comes after the central bank raised the maximum amount to 20% from 10% on Monday and was made in an attempt to increase its FX reserves, at least optically. What is even more concerning than the collapse in reserves, however, is that even locals now appear to have lost faith in a currency which the government is forced to defend at any cost - literally - and on Thursday the Lira fell 5% to 5.5914 per dollar amid a sell-off that’s roiling the nation’s markets, as the very same measures designed to deter short-sellers from selling the currency before municipal elections on Sunday achieved the opposite outcome and spooked investors, both foreign and domestic. According to a trader quoted by Bloomberg, Turkish investors bought an estimated $3.5 billion worth so far this week as locals have bought at least $1 billion a day. As a result, the latest central bank data reveals that Turkish investors now hold a record $176 billion worth of hard currency after buying around $25 billion since early September. Meanwhile, as Erdogan has focused on the currency, other market indicators are screaming full-blown crisis and on Thursday, Turkey’s five-year credit default swaps widened for an eighth day to 462, the highest since September, while the yield on the nation’s benchmark 10-year lira bond jumped 91bps to over 19%. As Bloomberg notes, the cost of protection on Turkish sovereign notes has jumped above that for Iraq, Greece, Angola and Pakistan. Governments with costlier CDS include Ukraine, Argentina and Lebanon... for now. The turnaround in market perceptions for Turkey was especially striking because its CDS had been calmly declining even as the economy sank into recession. It wasn't until recent fears about the plunge in reserves, that the CDS rout accelerated. If only assumes the historical correlation holds, the Turkish Lira will soon tumble to about 6.00 vs the dollar. 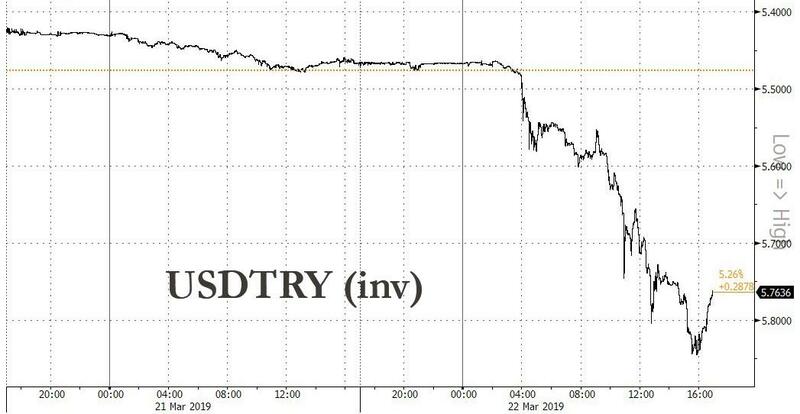 So with Turkey now once again in a full-blown financial crisis and this time with the added kicker of its reserves dwindling to dangerous levels yesterday's quasi capital controls notwithstanding, traders' attention turns to what happens next week after the local elections are out of the way. The expectation in the market is that offshore lira liquidity will be relaxed after the weekend elections, resulting in FX swap rates collapsing and enabling trapped lira longs to exit their positions. In fact, it appears that this has already happened, and the selling in the lira has resumed. Adding to the comedy, the president said that a "cornering operation targeting foreign exchange and interest rates were foiled", ignoring to add that as a result of this operation, the last trace of confidence investors may have had in his increasingly banana republic may have now evaporated. 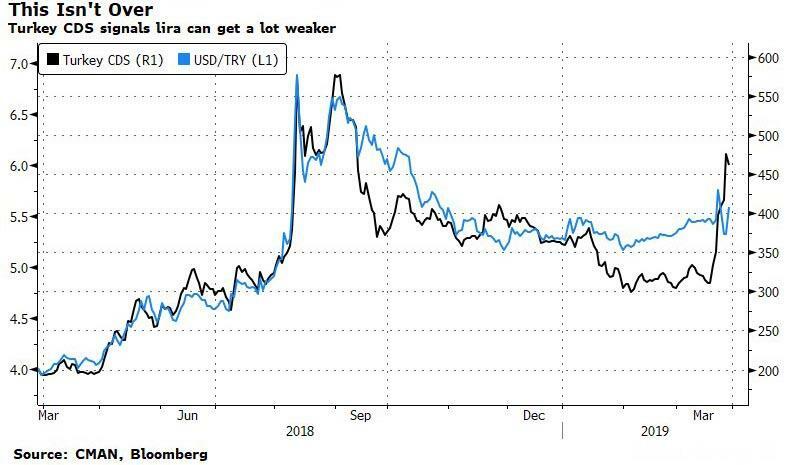 And while Erdogan also said that speculators should be tamed, the greatest worry for lira bulls should be that Erdogan is once again also targeting high interest rates as the source of the country's woes, saying that "they", i.e. the central bank, "have to cut interest rates or the inflation problem will carry on." Of course, whatever Erdogan wants, Erdogan gets so as soon as the local elections are over, expect a coordinated attack by the Turkish executive branch on the central bank of the country which is now mired in a deep recession where prices are soaring, urging for much lower rates, which in turn will soon send the lira plunging to new all time lows. The collapse in the Turkish lira is accelerating this morning, with the USDTRY rising above 5.80 for the first time since last October and CDS pushing to September highs, as the Turkish economy continues to slide ever deeper into recession, with the country on Monday reporting that a whopping 366,000 people became unemployed in the last month, sending the country's jobless rate to the highest level in a decade. ... from 13.5% a month earlier, according to Turkstat data; the number of people without jobs has reached 4.7 million people, with youth unemployment jumping to 26.7%, the highest on record. 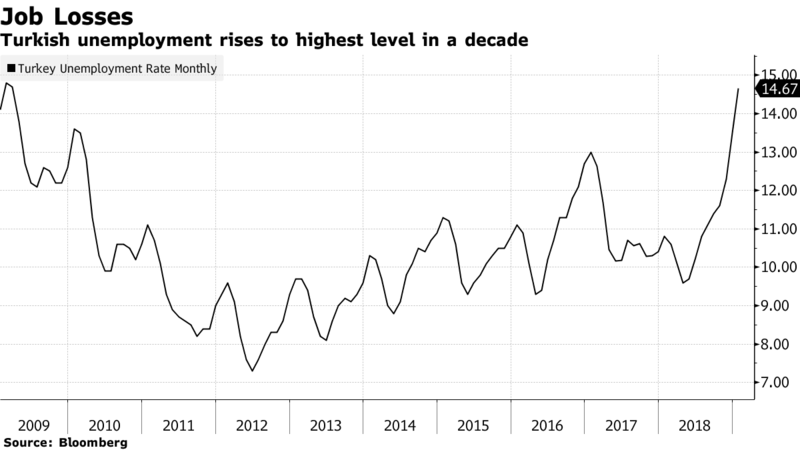 As Bloomberg summarizes "the severity of the job losses despite a last-ditch spending blitz by the government underscores the economic challenges facing Turkey after it entered its first recession in a decade following a currency rout last year that touched off inflation." The most recent dismal economic data comes at a time when Erdogan's undisputed control over Turkey appears to be slipping following the recent local elections, where many of the municipalities won by the opposition from the ruling party were those where unemployment is running in double digits, official data show. As such, the political headache for the "executive president" is only set to grow as the country finds itself deeper and deeper in what is rapidly developing as a full-blown economic depression. Meanwhile, investors were also concerned by ongoing speculation that the ruling AKP will challenge the Istanbul election outcome which saw Turkey's most important city flip control to the opposition, after Erdogan’s candidate lost the mayoral race in Turkey’s largest city to Ekrem Imamoglu, a blow for Islamists who had controlled Istanbul since 1994. “We are going to ask for fresh elections in Istanbul by using our right to make an extraordinary objection,” said Ali Ihsan Yavuz, a deputy head of the AKP. But beside the collapsing Turkish economy, which was to be largely expected following last summer's financial crisis, what has mostly spooked investors is that even as Turkey rolled out a recapitalization plan for state banks, the program unveiled by Treasury & Finance Minister Berat Albayrak last week has underwhelmed investors. In fact, as Axios reports, Turkish Finance Minister Berat Albayrak - Erdogan's son-in-law who replaced 2 highly respected ministers, despite having virtually no qualifications - held a closed-door meeting with hundreds of investors during the IMF-World Bank meetings in Washington last week, "and some who attended called it the worst they've ever had with a high-ranking government official." "It was an absolute $#@! show," one emerging market fund manager who attended the meeting told Axios. "I've literally never seen someone from an administration that unprepared," another investor said. And, as Axios correctly notes, the disastrous meetings "could not have come at a worse time for Turkey. 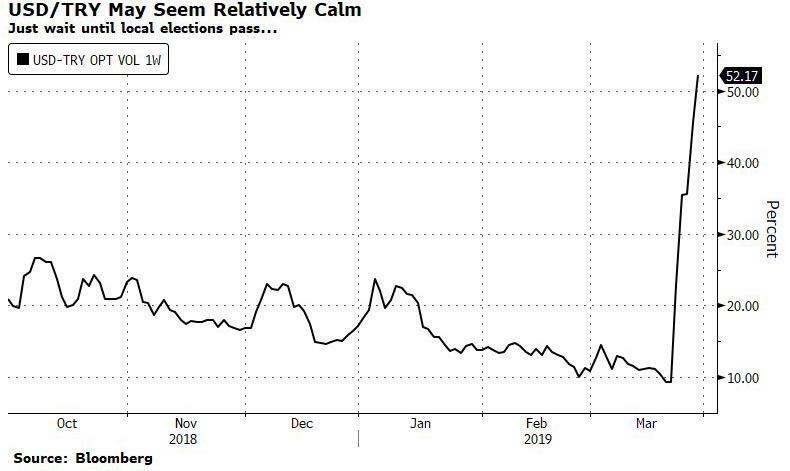 Investors are growing more anxious as the country heads toward recession and President Recep Tayyip Erdogan is seeing his popularity erode." Incidentally, what this means is that starting tomorrow, Axios will most likely be banned in Turkey. Meanwhile, as Turkey faces growing headwinds both domestically, as the economy slides deeper into recession, and internationally where critical foreign capital is increasingly diverting to other emerging markets, locals are accelerating their shifting toward conducting business in hard currencies such as dollars and euros, and away from the Turkish lira. Three weeks ago, when Turkey was scrambling to defend the lira ahead of local municipal elections, a potentially destabilizing event which saw significant selling of the currency (and which ended up badly for Erdogan's ruling AKP party, which lost control of the two most important cities, Ankara and Istanbul), we reported that "the Turkish central bank had burnt through at least a third of its foreign reserves in March in an effort to stem a plunge in the lira", in a repeat of the crisis that engulfed the lira last summer and triggered a blast of inflation and the first recession in a decade, and was "putting the country on path to a full-blown currency and funding crisis." And despite what was a clear, continued central bank defense of the Turkish lira since then, Turkey's official reserves actually appeared to rise, in what was meant to telegraph confidence in the currency and give the impression that the lira was stable without continued central bank support. There was just one problem: the central bank appears to have been if not lying, then grossly misrepresenting the true state of the country's foreign reserves . As it turns out, Turkey has been pulling a financial trick popularized by China's PBOC for the past several years, and according to the FT, the country's central bank was propping up its foreign currency reserves with billions of dollars of short-term borrowed money, "raising fears among analysts and investors that the country is overstating its ability to defend itself in a fresh lira crisis." After tumbling from a recent high of $34 billion to $25 billion at the end of March, Turkey reported that the net foreign reserves held by the central bank stood at $28.1 billion in early April — a sum which the FT notes was already believed to be inadequate because of Turkey’s heavy need for dollars to cover debt and foreign trade. But what the Financial Times uncovered is that this total was "enhanced" by a surge in the use of swaps, or short-term borrowings, since March 25. Stripping those swaps out, the total is an alarmingly low $16 billion, an amount which could be depleted in just months, if not weeks, especially if the news of the CB's plunging reserves creates a self-fulfilling prophecy in which lira holders rush to convert their currency before the central banks runs out of dollars. 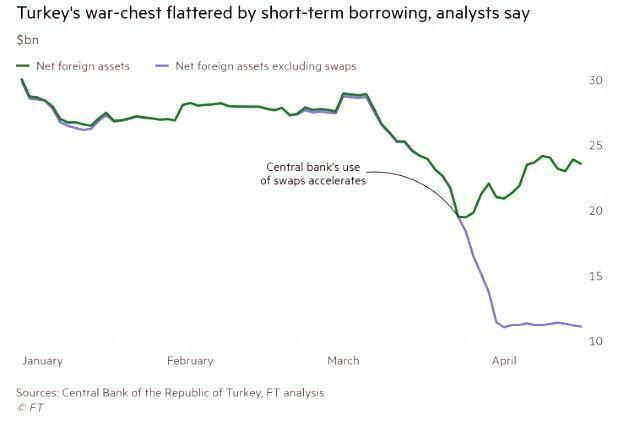 The chart below shows two sets of numbers: Turkey's true net foreign reserves, and the number that the central bank had used for public consumption, which includes the nominal amount of swaps. Confirming the FT's analysis, a former senior official at Turkey’s central bank, who did not wish to be named (as it would mean an instant prison sentence by the country's "executive president"), said the extra dollars had been borrowed, not earned. "This is not an orthodox [approach to] central bank reserve build-up." Erdogan Threatens Moody's With An "Operation"